MIS announces the successful rollout of version 4 of the Community platform professional achievement program. Since 2008, the program continues to break new ground in creating a structured measurable process for student professional development that provides recognition, external and internal branding, and opportunities for high achievers. The program pioneered at Fox MIS has been licensed at other universities, while portions have been copied by others. PRO provides the structure for professional development. The goal is for students to get good jobs; so the e-portfolio badge summarizes professional achievement, the points widget lists the activities, while the posts show how each activity influences professional development. 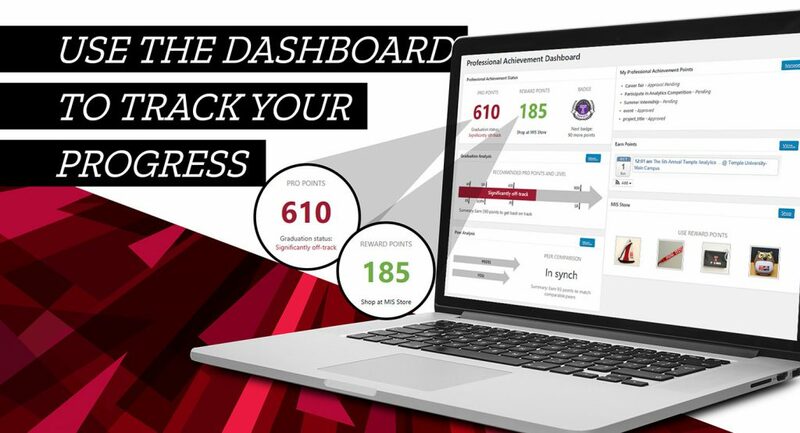 Finally, PRO points measure activities so that students can get started early and stay on track using analytics available on an integrative Dashboard. As part of the above roll out, the overall MIS Community site was updated with new content, a new mobile responsive look and feel, including the new Community activity widget. The e-portfolios of faculty, staff, and Master’s students also have a new mobile responsive look and feel with capabilities that integrate with the main site (e.g., research news). Professional achievement is professional development, career knowledge, leadership, networking, and readiness for the workplace. Professional achievement is different from academic achievement, both are important. Employers expect that new hires will have the skills and knowledge to perform their job and the savvy, communication skills, and relevant experiences to hit the ground running. A high level of professional achievement shows employers that you can apply learning to practice, and that you can work with your peers and accomplish goals. Academic achievement is measured by GPA, professional achievement is measured by professional achievement points. Revised Professional Achievement Point earning model includes new point earning categories and revised point allocations (some allocations went up and some went down). Professional achievement and reward points for certain activities are automatically awarded by the department (e.g., attendance at department events.). Submit requests for activities such as internships by adding a new point request (post) to your e-portfolio. Once awarded, points are automatically displayed on the e-portfolio. The Professional Achievement Widget will now automatically display Professional Achievement Points and badges on student eportfolios. Review and check on points on the Community Dashboard. Earn one ‘Reward Point’ for use in the MIS Store for each earned Professional Achievement Point. Reward points get deducted when they are used – professional achievement points never get deducted. The ‘prices’ in the store are now lower and the minimum is gone so you can get your favorite store item now! Top achievers receive new academic and industry engagement opportunities. Lunches with MIS faculty or staff. Lunch / dinner with Fox IT advisory board members. AIS will receive a cash award each term based on the number of points earned by AIS members. This means that AIS members get to double dip, earn points for yourself and earn points for your organization! What if there was a tool that created an educational environment that didn’t just teach but engaged students so that learning was communal—an interactive social activity, not a static one-way street of facts and stats flowing from teacher to student?And suppose that same tool allowed high school kids to learn how to manage their digital lives and, as those kids became college students, gave them a chance to build their online professional presence. That tool exists, and it was built by Fox School’s Management Information Systems department. This year it was used not just by Fox MIS, but by college students at Loyola University Maryland and by high schoolers at KIPP DuBois Collegiate Academy, in Philadelphia. The Temple Community Platform is a Web 2.0, cloud-hosted platform based on WordPress. It allows students to create profiles and maintain e-portfolios of their work. Professors and administrators also have profiles, plus share assignments and course descriptions. All users comment and share– some blog and post articles. Plus, it’s gamified. Students get points for their efforts. At the Loyola University Maryland’s Sellinger School of Business and Management, Professor and DeFrancis Scholar in Information Systems, Paul Tallon, read about MIS students using e-portfolios at a Fox career fair. Tallon was intrigued. “It whetted my appetite because we talked about doing something like that,” he said. 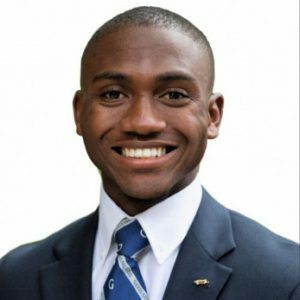 Tallon reached out to do some fact gathering, and shortly thereafter found himself running a pilot program at Loyola, with the platform hosted and supported by Temple. The first semester the platform was up and running, Tallon made creating an e-portfolio a class requirement in one of his courses. Twenty-eight students went step-by-step through the process of creating a deliberate digital identity. Tallon said, “I’m convinced this is the way to go.” By using a platform that works the way Facebook and LinkedIn work, but is specifically for educational and professional purposes, students learn to post and interact in ways that are more polished than on social media sites. With the Temple and Loyola platforms, future employers can search the e-portfolios, looking for specific skill sets and experience and see the resumes and projects that have been posted. This helps match students with the right internship—and, eventually, the right job. The second pilot program took place at KIPP DuBois Collegiate Academy, in Philadelphia (a public charter school in an historically underserved area of the city). Rachel Kyler, a teacher and the Director of College Placement, explained that at the high school level the community platform is closed to outsiders, due to a need for student privacy, but open to the school community. But, like the business schools, one of the major goals of KIPP is to prepare kids for the working world. 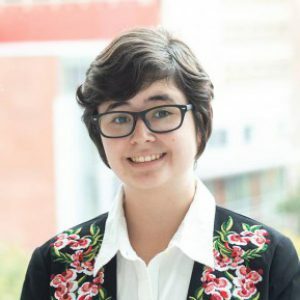 To be successful, they need to develop “soft skills (like) networking” and to work at internships, Sarah Gomez, Managing Director of KIPP Through College said. The platform (note: link leads to password protected site) was rolled out to more than 100 11th graders as part of their Junior College Seminar. The goal was to give the students a place put their resume, showcase their work and communicate with each other about their internships over the summer. The platform helped streamline the internship process for the school staff, and will help with both accountability and helping kids overcome challenges during the summer. 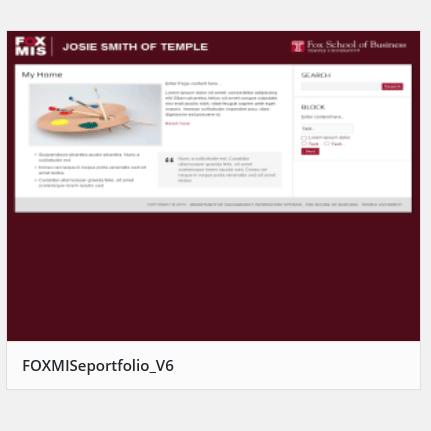 The Temple Community Platform was conceived in 2008 for the Fox School’s Department of Management Information Systems and since inception has hosted 7300+ members, 5900+ sites, 1200+ e-portfolios, 17,000+ posts, 48,000+ comments, and 300+ courses. It is being used by Temple’s School of Tourism and the Fox School’s Department of Human Resource Management and talks are underway to expand use at Loyola University. FOX MIS students have been accruing professional achievement points and badges all year long for IT-related work, participation in AIS, and e-portfolio contributions. Sure, these points ultimately enhance an individual’s career, development, and future — but do you know what is even better? Now students can redeem said points at FOX MIS’ online store! Grand Master (2000 plus): The pinnacle of professional readiness. Grand Master’s have extensive experience in engaging with industry, have demonstrated extensive leadership and communication skills, and are likely to take on leadership roles in the future. Master (1500 plus): The master of professional achievement. Master’s have gone above and beyond all the basic requirements and excelled in every category of professional development, career knowledge, networking and are expected to be stars in their careers. Candidate (1000 plus): The complete well-rounded student. Candidates have excelled in meeting all the department’s requirements for professional development. They are ready for the workplace! Apprentice (700 plus): Apprentices have started investing in their professional development early and are well on track to meet the department’s requirements for professional achievement. 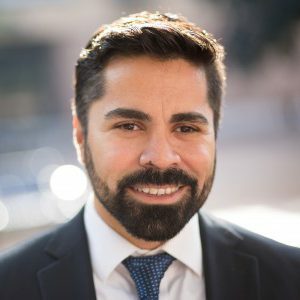 Read the article by Peter Key of the Philadelphia Business Journal on the MIS Community platform! Two major trends are shaping higher education today. One is that attracting high quality students has become even more competitive. Second, the job market for college graduates is gradually improving, but still challenging. Together, these trends make it all the more important that universities are not just providing a well-rounded education for undergraduates, but are also specifically preparing them to successfully enter the workforce. Here in the Management Information Systems department of the Temple University Fox School of Business we’ve developed an innovative system for motivating students to engage in their Professional Development. We implemented a point system for our program about 1.5 years ago so that students need to achieve 1000 professional development points before they can graduate. More recently, we introduced a leaderboard that showcases the students with the most amount of points. Today, I am pleased to announce ‘professional achievement’ badges for our students. Candidate (1000 plus): The complete well rounded student. Candidates have excelled in meeting all the department’s requirements for professional development. They are ready for the workplace! Coming up with appropriate labels and a way to describe it all was incredibly challenging! We will do a soft roll out over the summer and then more formally in the fall. I am sure we will learn from this experience and after a year we will take another look at the levels, labels, and point categories and revise and improve. As Munir says, it’s not easy to define meaningful levels and appealing badges. And, yet, it’s one of those many little details that goes into designing and implementing effective gamification. What do you think? Would a system of points, levels, and badges have helped you work harder on your own professional development in college? If you hire recent college graduates, would a badge like this be of value to you in assessing student abilities? port•fo•li•o (pôrt-fo¹lê-o´, port-) noun – The collection of materials which are representative of a person’s work: a photographer’s portfolio; an artist’s portfolio of drawings. 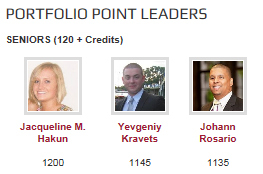 (new) gaining recognition for their achievements through the e-portfolio wire and portfolio point leader board. MIS students start to develop a portfolio in their first MIS class and continue to receive opportunities to add to their portfolio as they progress through the curriculum. Checkpoints throughout the curriculum make sure that students stay on course to graduate with the required number of minimum points. Students receive points for participation in professional development activities and for applying academic learning to practice (e.g., internships, student organization leadership). Students showcase their achievements on e-portfolios. The portfolio points program was started in spring 2012 by Professor Mart Doyle. The home page layout is logically organized around News (on the left), In-depth content (middle), and Community (the sidebar on the right). This design metaphor is applied everywhere. For example, the BBA in MIS program page includes content on the left and (relevant) community on the right. If you are a top student, you might see yourself on there! Every single page on the main site has been updated and is now focused on the community vision. Related to that, the new totals widget (top right of the home page) shows the full breadth of our community and all the items are clickable – click the “activity today…” to see what is going on today! The new E-portfolio wire showcases the professional interests and accomplishments of students. If a student adds a skill, job interest, updates their job status, changes their major, or submits their e-portfolio. You will see it first on the e-portfolio wire! The site has been re-architected from the ground up to increase performance. You have likely seen performance improvements in the last few weeks. They include (a) a mobile responsive theme that will adjust to different devices, screen sizes, and connection speeds (try the site on your mobile device), (b) custom developed plugins by the MIS department that add community relevant features, (c) feed aggregation that allows us to continue integrating multiple sources of content through RSS but without the performance hit. This was a massive behind the scene effort and critical toward allowing us scale the site and concept. Social integration, so that you can leave comments on the site or push pages to the main social platforms (e.g., Facebook). The department also has related sites on Facebook, LinkedIn, and Flickr. We will be rolling out more updates in the next few weeks as well as new student e-portfolio themes. We are also starting to help other academic units at Temple catch the community wave, but the MIS community site was the first and will remain the gold standard! Stay tuned. 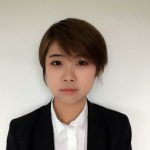 The MIS community site is a unique learning, collaboration, and social platform; there is no other like it. And now it is better and even closer to the community vision. What better place for a career fair to go high-tech than one for IT-centric students? Temple’s Fox School of Business hosted its first IT Career Fair on Wednesday and, in another first, business students with majors and minors related to information systems carried business cards with QR codes for recruiters, who were equipped with iPads to scan the codes and access students’ e-portfolios. 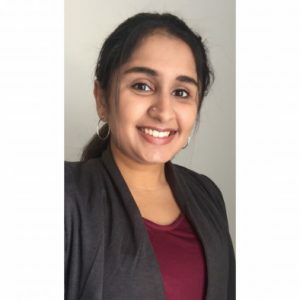 Also known as electronic resumes, e-portfolios allow students to manage their online identities and showcase experiences and sample work in a more dynamic format than a LinkedIn profile. The e-portfolio initiative, overseen by the Institute for Business and Information Technology (IBIT), includes custom design elements and a search engine for employers to find students by relevant criteria. There are 1,023 e-portfolios in active use.